and here’s Tom’s take on it for Grist, My Farm Hits the Newstands (June 28, 2007). The Enigma of Maverick Farms, Jim Leff’s April 2005 farm dinner food review (thanks to Jim for archiving these on his site, as we are now regularly experiencing the effects of link-rot), as well as his report on his lard potato-chip tasting and various other adventures around the farm on September 26, 2006 (along with some delightful short videos featuring Leo). 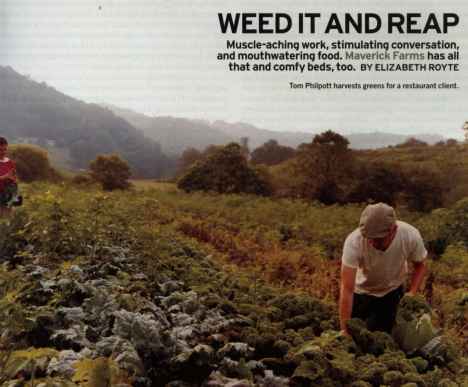 Hillary Wilson explains the Maverick Farms CSA in 2008 to the Practical Guide to Healthier Living, with music by farmhand Jesse Downs. Here’s our photo album on Facebook (through 2013). Here’s a fantastic video, Growing Farmers, made by Ted Morée about the FIG Farm (August 2013).